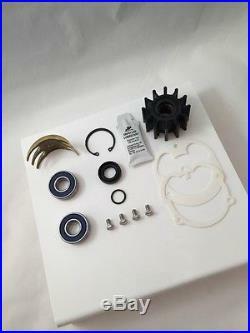 This is a rebuild kit to rebuild your Volvo Penta or OMC side mounted raw water pump. It will work with part number 3858847 and 3857794 as well as their superseded part numbers. These pumps were used on several Volvo Penta engines sizes from 3.0 to 7.4. If you have a fitment question please ask. 2 OEM Premium SKF bearings with contact seals on both sides. 4 Stainless Steel hex bolts. 1 Shaft seal with 316 Stainless Steel Spring. 1 Impeller - OEM Johnson. 2 OEM end cover gaskets. If you want to send me your pump to be rebuilt please view my other auctions. 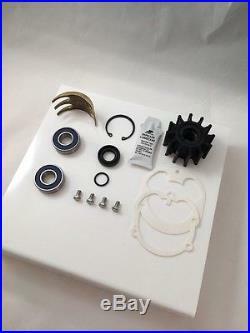 The item "Volvo Penta Raw Water Sea Pump Rebuild Kit Impeller Seal Cam 3857794 3858847 OMC" is in sale since Tuesday, August 05, 2014. This item is in the category "eBay Motors\Parts & Accessories\Boat Parts\Sterndrive Motors & Components\Cooling System". The seller is "rawpumps" and is located in Plainfield, Illinois. This item can be shipped to United States, Canada, United Kingdom, Denmark, Romania, Slovakia, Bulgaria, Czech republic, Finland, Hungary, Latvia, Lithuania, Malta, Estonia, Australia, Greece, Portugal, Cyprus, Slovenia, Japan, China, Sweden, South Korea, Taiwan, South africa, Thailand, Belgium, France, Hong Kong, Ireland, Netherlands, Poland, Spain, Italy, Germany, Austria, Russian federation, Israel, Mexico, New Zealand, Philippines, Singapore, Switzerland, Norway, Saudi arabia, Ukraine, United arab emirates, Qatar, Kuwait, Bahrain, Croatia, Malaysia, Brazil, Chile, Colombia, Costa rica, Dominican republic, Panama, Trinidad and tobago, Guatemala, El salvador, Honduras, Jamaica.